Joseph Henry Nuxhall (/ˈnʌks.hɔːl/; July 30, 1928 – November 15, 2007) was an American left-handed pitcher in Major League Baseball, mostly for the Cincinnati Reds. Immediately after retiring as a player, he became a radio broadcaster for the Reds from 1967 through 2004, and continued part-time up until his death in 2007. Nuxhall held the team's record for career games pitched (484) from 1965 to 1975, and still holds the team mark for left-handers. In addition to his 40 years of broadcasting Reds games, Nuxhall is most remembered for having been the youngest player ever to appear in a major league game, pitching 2/3 of an inning for the Reds on June 10, 1944 at the age of 7008500666400000000♠15 years, 316 days. Called upon for that one game due to player shortages during World War II, Nuxhall would eventually find his way back to the Reds in 1952, and the National League All-Star team in 1955 and 1956. Long known as "The Ol' Left-hander", he compiled a career earned run average of 3.90 and a record of 135-117 during his 16-season career, with all but five of his victories being earned with the Reds. Nuxhall died in 2007 after a long battle with cancer. Nuxhall was born and raised in Hamilton, Ohio. During World War II, many regular baseball players were unavailable while serving in the military. Meanwhile, Nuxhall was the biggest member of the ninth grade class in nearby Hamilton, Ohio at 6 feet 2 inches (1.88 m) and 190 pounds (86 kg)—a left-hander with a hard fastball, but not much control. He had already been playing in a semipro league with his father for a few years. Scouts looking to fill out the Reds' depleted roster were following Orville Nuxhall, Joe's father, in 1943. But they were informed that the elder Nuxhall was not interested in signing a professional contract because of his five children. The scouts then became interested in the son, who was only 14 at the time. After waiting until the following year's basketball season was over, Nuxhall signed a major league contract with the Reds on February 18, 1944. General manager Warren Giles intended to wait until school was over in June to add him to the team, but more of his players were inducted into the service in the spring. With permission from his high school principal, Nuxhall was in uniform with the team on Opening Day. On June 10, the Reds were playing the first place St. Louis Cardinals at Crosley Field and trailing 13–0 in the ninth inning when Manager Bill McKechnie called on Nuxhall to enter the game. He started well, retiring the first batter he faced, Cardinals shortstop George Fallon, on a groundout. But he was unable to get out of the inning, yielding five walks, two hits, one wild pitch and five runs. He spent the rest of the 1944 season in the minor leagues. But unlike Jake Eisenhart, who made his debut for the Reds the same day by getting the last out of the frame, Nuxhall would return to pitch in the majors. Nuxhall remains the youngest person to play in a major league game in history. During his lifetime, it was believed that a 14-year-old named Fred Chapman pitched five innings in one 1887 game. However, in 2009, the Society for American Baseball Research discovered that this player's name and age were both incorrect. The 1887 player was actually named Frank Chapman, and he was 25 years old at the time of his only major league appearance. There have also been sources listing Billy Geer, who played for the 1874 New York Mutuals of the National Association, as having a birth date in 1859, but this is questionable as well, as is whether the National Association was a major league. Joe Reliford, a 12-year-old batboy for the Class D Fitzgerald Pioneers, became the youngest person to ever play in a professional baseball game in 1952 when he was called on to pinch-hit. Following his appearance with the Reds, he was assigned to the Birmingham Barons in the Southern League, but pitched only a third of an inning there (he struck out his first batter, then allowed a hit, five walks, a hit batter and five runs). Nuxhall attended spring training with the Reds in 1945, but decided to remain home until he finished high school the following year. He regained his amateur status and played football, basketball and baseball for Hamilton High School as a senior in 1946, earning all-state honors in football and basketball. 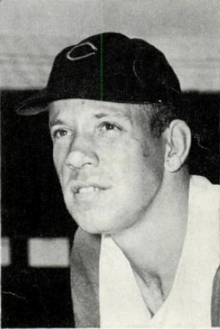 Over the next five years, Nuxhall played in the minor leagues with Syracuse, Lima, Muncie, Columbia, Charleston, and Tulsa before returning to the Reds in 1952. Nuxhall briefly returned to the minors in 1962 with the San Diego Padres. Nuxhall spent almost 15 of his 16 major league seasons with Cincinnati, where he was a two-time National League All-Star and led the league in shutouts in 1955. He also played for the Kansas City Athletics and Los Angeles Angels in the American League before returning to the Reds. In 1965 he broke Eppa Rixey's team record of 440 games pitched; his final mark of 484 stood until Clay Carroll surpassed it in 1975. Nuxhall retired from the Reds in April 1967 and under the guidance of Hamilton sports broadcaster, Ray Motley, immediately began his second career as a Reds broadcaster despite his lack of broadcasting experience. Part of his trademark radio signoff phrase – "This is the old left-hander, rounding third and heading for home" – is displayed on the outside of the Reds' stadium, Great American Ball Park, which opened in 2003. A likeness of Nuxhall (see photo) is one of four statues that decorate the main entrance of the stadium (The others are Ernie Lombardi, Ted Kluszewski and Frank Robinson). He was elected to the Cincinnati Reds Hall of Fame in 1968, and officially retired from the Reds on October 3, 2004, 60 years after his pitching debut, though he still made guest appearances on some game broadcasts. For many years after retiring as a player and during his broadcasting career, Nuxhall pitched batting practice for the Reds. In addition to being called "Nuxy" and "the ole lefthander", Nuxhall was also known as "Hamilton Joe", particularly to locals. He spent nearly 62 of his 64 baseball seasons with the Reds (or one of its minor-league clubs) as a player or an announcer from 1944–2007; the only exceptions being 1946 (when he was on the "voluntarily retired" list — in reality, he went back to high school), 1961 (when he was dealt to the Kansas City A's) and 1962 (pitching for a few weeks with the Los Angeles Angels before heading back to Cincinnati). On June 6, 2007, the Reds honored Nuxhall, Marty Brennaman, and Waite Hoyt with replica microphones that hang on the wall near the radio booth. At Redsfest in December, 2007 the Reds announced Nuxhall would be honored throughout the 2008 baseball season – their uniforms would display a dark patch with the word "NUXY" printed in white. On March 31, 2008 the Cincinnati Reds paid tribute to Nuxhall by wearing his #41 jersey for opening day. In December 2007, Nuxhall was named as one of the ten finalists for the National Baseball Hall of Fame's Ford C. Frick Award, an honor bestowed annually on broadcasters who make major contributions to the game of baseball. Of more than 122,000 online ballots cast by fans, Nuxhall received 82,304 votes. Despite this show of support, it was announced on February 19, 2008 that the Frick election committee had voted in favor of the voice of the Seattle Mariners, Dave Niehaus. In September 2004, Orange Frazer Press released Joe: Rounding Third & Heading for Home. A portion of the proceeds from the book benefits the Joe Nuxhall Character Education Fund, which was established in 2003 to underwrite character development programs and projects for children. In the days following Nuxhall's death, several radio stations in the Cincinnati area devoted shows to him, and fans left cards, flowers and banners at the statue of Nuxhall at Great American Ball Park. A public visitation ceremony was attended by thousands of fans and several local and national sports and broadcasting personalities. At his visitation held at Fairfield High School, an estimated 6,000 people showed up to pay their respects to Nuxhall and the Nuxhall family. The Reds remembered Nuxhall on their 2008 Opening Day. Players wore an alternate jersey during their introductions, which bore the number 41 and Nuxhall's name on the back. Aaron Harang, who usually wore the number 39 jersey, was allowed by MLB to wear the number 41 jersey with Nuxhall's name for the entire game. Nuxhall's number 41 was honored by the team displaying it in left-center field over the Reds' bullpen. Reds players wore patches with "Nuxy" and his number 41 on them as a tribute. ↑ Kay, Joe (June 5, 1994). "At Age 15, Nuxhall Grew Up in a Hurry : The Youngest-Ever Pitcher in Majors Broke in 50 Years Ago Against Musial". Los Angeles Times. Associated Press. Archived from the original on September 20, 2015. ↑ "SABR Biographical Research Committee, March/April 2009 Report" (pdf) (Press release). Society for American Baseball Research. March–April 2009. Retrieved 2010-05-25. Section "Joe Nuxhall's Record is Safe"
↑ "SABR Biographical Research Committee, October 2009 Report" (pdf) (Press release). Society for American Baseball Research. October 2009. Retrieved 2010-05-25. Section "Frank Chapman"
↑ Doane, Kathleen (September 2004). "Cry Foul and Let Loose Nuxhall". Cincinnati. Emmis Communications. p. 30. Retrieved July 5, 2016. Van Blair, Rick (1994). Dugout to Foxhole: Interviews with Baseball Players Whose Careers Were Affected by World War II. Jefferson, North Carolina: McFarland & Company Publishers.